Like many Tim Tebow fans I have been dismayed and annoyed to no end at the unfair media coverage of the whole Tebow to Jets move and the endless and unjustified criticism of Tim Tebow. To me the only issue with the New York Jets is that you have a coach of a losing team not realize he has a winner that he refuses to play. And for that reason I feel like Rex Ryan and the Jets have gotten just what they deserve, humiliating loss after humiliating loss. Now I consider myself a Tebow fan and a Jets fan, and I think to call the whole move by the Jets to acquire Tebow a dismal failure is both ridiculous and completely unjustified. How can you call the Tebow-Jets union a failure when Tebow didn’t even get to play for them. For the whole situation to be called a failure Tebow would have had to start at least 8 games and played 100 percent of the time and lose every game for it to be called a failure. That didn’t happen so there’s no way it can be called a failure. Neither can it be called a success. All it can be called is: an experiment that never happened. The truth of the matter is the Jets are not the same team they were 3 seasons ago. Everybody in New York and the league knows that. And the reasons for their downslide is much much bigger than whose the starting quarterback. Every aspect of the team’s play is substandard quality and unless that changes even bringing in Peyton Manning or Tom Brady would not change anything (maybe a little bit, but nothing substantial). By the way, Manning and Brady would not have the success they have if they did not have an A List team around them on both sides of the ball. Look at Manning’s move to the Broncos: he overhauled that entire offense. He’s upgraded everyone around him, even brining his ex-team mates from Indy over to Denver. No other quarterback gets to do that. So the New York Jets has seen their quality of play decrease with each game, and Rex Ryan has been unable to do anything about it. By the way Rex: coming up to the podium after every game each week and saying the team’s play was horrible does nothing if you don’t personally improve their performance as the coach. You’re just pointing out the obvious. Now Tim Tebow is a winner. His record speaks for itself. He doesn’t need to defend his ability to anyone. And the throngs of people who are on the anti-Tebow bandwagon are not worth wasting time on. Its the nature of sports that no matter how successful an athlete is, for some no matter what they do they won’t get the respect or credit they deserve. So there’s nothing you can do about that, so don’t even bother. Stories of people not getting credit is true not only of Tebow but even Colt McCoy at Texas or Greg McElroy at Alabama. So it is what it is. But one fact that cannot be denied is that Tebow is a winner. Last season the Denver Broncos were a failing, losing team and they made one change: they brought in Tim Tebow and left the entire team like it was before he came in to play and they went from a losing team to a winning team. So no matter how much you hate Tebow this is hard truth you cannot get around plain and simple. Tim Tebow made the difference in Denver. So you have a losing team and you have a winner and you choose not to play the winner? What then do you expect; of course you’ll continue losing. And that’s exactly what’s happened in New York. 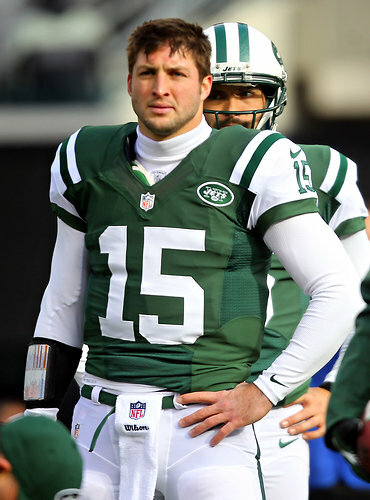 The only failure with this whole situation is Rex Ryan’s refusal to play Tim Tebow. He played Sanchez and he lost. He played McElory and he lost. He hasn’t played Tebow. So how is Tebow a failure? Playing Tebow for 3 snaps a game means nothing. Its like playing a baseball player 3 times a season and saying because he did not hit a home run those 3 times they put him in at bat, he’s a failure. That’s ridiculous, especially when everyone else gets 15 chances at bat every game and none of them have hit home-runs. That’s unfair and unjustified criticism. Tim Tebow has nothing to be embarrassed or ashamed about: he’s a winner. He’s record speaks for itself, and he doesn’t need to defend it to anyone. High School, College and Pro he’s record speaks for itself. Rex Ryan’s failure as a coach has been his inability to improve the performance of his team and his inability to admit the hard truth that Mark Sanchez isn’t working out for whatever reason, and that a change was long overdue. Then on top of that you have a player whose proven he can turn an entire team around and you refuse to start him? That doesn’t make any sense at all. The situation with the Jets is dismal regardless of whose playing quarterback so how in the world could playing Tebow have hurt them? No one’s saying Tebow would’ve turned that whole team’s performance around, we don’t know what would’ve happened because he never got the chance. My question is just this: your team’s losing and you have a proven winner on the sidelines, why won’t you play him? Tim Tebow’s a winner and he will succeed wherever he goes, as long as he is surrounded by a good supporting cast. And Rex Ryan’s days in New York are numbered, whether he departs this offseason or in the next 3 years, he’s days are numbered. So Tebow can walk away from the Jets with his head held high, and without feeling an ounce of embarrassment because his was the experiment that never happened. We all thought it would, but it never did.